These bunnies are all worn out from delivering eggs, so they’re taking a rest on a bench made of sugar wafer cookies. 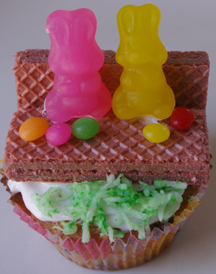 What You Need: 1 cupcake; 2 sugar wafer cookies; white frosting; shaved coconut; green food coloring; 2 gummy bunnies; small pastel candies. How to Make It: Frost cupcake white. Use some frosting to attach one sugar wafer cookie to the other in an L shape to make a bench. Let set and place on cupcake. Use dabs of icing to position bunnies on bench. Add small candies or any other decor you would like. Tint coconut green and sprinkle on cupcake for grass. 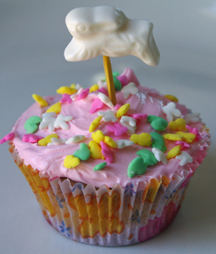 For a fun Easter cupcake, perch a Peep among a patch of cute carrots. I got the idea for the carrots from a Wilton design, but swapped out the candy bunny for a marshmallow Peep. 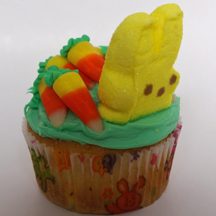 What You Need: 1 cupcake; green frosting; 1 marshmallow Peep bunny; 5 to 7 candy corn pieces; green icing in tube with leaf tip attachment, or pastry bag with leaf tip and coupler attached. How to Make It: Frost cupcake green. It’s easiest to arrange the candy corn first. Then, use leaf tip to squeeze small amount of green icing on wide part of candy corn for stems. Cut Peep at about the neckline (ouch!) and place near front of cupcake as shown. 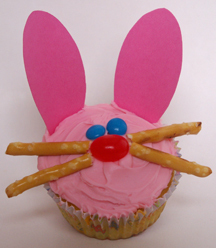 I combined ideas from a few different Easter bunny cupcake designs I’d seen online and in magazines to make this cupcake, who has two unusual features: pretzel whiskers and paper ears. For best results, insert the paper ears just before serving. What You Need: 1 cupcake; pink frosting; 4 stick pretzels; 1 red jellybean; mini blue M&Ms; pink cardstock; scissors. How to Make It: frost cupcake. Place red jellybean in center for nose. Add blue eyes directly above nose. Break or cut off a bit of pretzel ends if you think they’re too long (I did). Cut ear shapes, both at once, from pink cardstock, fold slightly and insert between cupcake and paper liner.